Introducing — Cassidy — gorgeous modern lines blend with traditional curvaceous cables! Chic Knits Cassidy features low-bulk easy cables, non-binding ribbing, set-in sleeves and a patterned hood for casual elegance and charm. 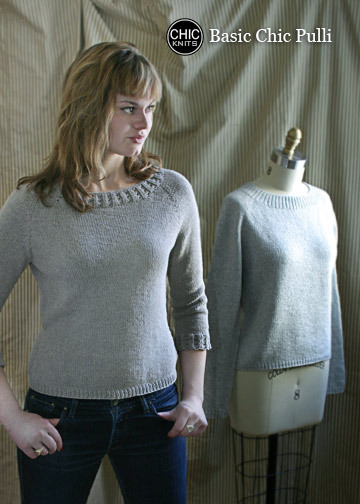 Cassidy looks fabulous made in wool, alpaca, cotton or blends using popular worsted gauge yarns. We had a blast with this pullover. Photo shoots are a lot like carnival rides: more flags OR more fun! And this one was fun (the model tried to sneak away wearing this pulli) especially once we picked up the bubbles. Basic Chic Pulli is in the house! to take the sample off?